Ambrozia Bar & Bistro: Aiming to be a place for regulars on the north side as well as a dining destination, Ambrozia boasts a long, wide bar constructed from pastel-stained wine boxes, warm blond wood, and touches of neon. The dinner and brunch selections are concise, but parts of the menu change weekly. I was trundling through a very hearty and delightful early spring meal, plus a bottle of wine, when everything came to a halt. I could no longer concentrate on what my dinner guest was saying. And now, a few weeks hence, I still think about this dessert. It was a grown-up sweet. Not a speck of chocolate, nor ice cream, but rather a Gorgonzola flan that was beautifully paired with a tender and prettily splayed stewed pear, cranberry-pear chutney, and sugared walnuts. Topping it off was a subtly orange-scented shortbread cookie that balanced on end. 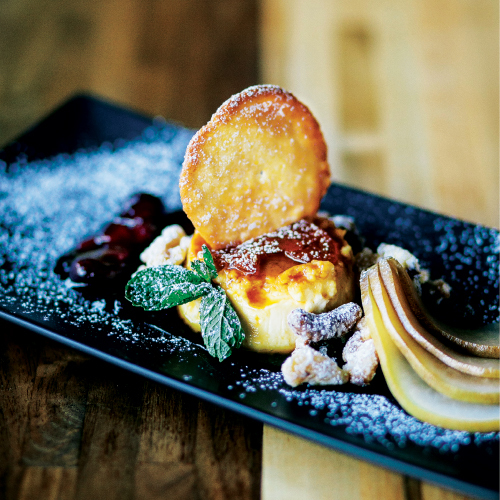 Such are the welcome surprises that Ambrozia Bar & Bistro, tucked into Beaver Lake Shopping Center in North Asheville, reveals with each ensuing visit. Open since last April, the stylishly sparse venue is the invention of Chef Sam Etheridge, a transplant from New Mexico. “It’s my style to have fun with it,” notes Etheridge, who says his cuisine is based on a mixture of the Southern foods he grew up eating, the Miami melting pot that furthered his cooking career, and the New Mexico chili-based cookery that he honed in his eponymous restaurant and bar in Albuquerque. Asheville hit all the right notes for Etheridge, who brought with him many members of his New Mexico staff. The Cheerwine-braised beef short rib is a menu staple that should never ever go away. Served over silky pimento cheese mashed potatoes, the meat proved tender and satisfying. The Cheerwine sauce was characteristically sweet, and married beautifully with a lemony and zesty collard green pesto. Considered a “small plate,” it was plenty big for my main dish. My table also enjoyed a vegetarian mushroom and collard green enchilada. The accompanying cranberry chutney and quinoa squash fry, with its nuances of grilled nuttiness, truly made the dish. The mole sauce was slightly on the sweet side, but we enjoyed its slow-rising heat. We paired all this with a somewhat tannic Spanish Honoro Vera 2011 Merlot. Had I more stomachs, I might have tried the sea scallops carbonara with English pea puree, or the hops-smoked chicken leg. A lamb brat with a house pretzel sounded like part of Etheridge’s quest for fun on the menu, as well. We might not all live in the north end of Asheville, but Ambrozia could easily become that neighborhood haunt, no matter where the journey begins.